J.H. Weaver and D.M. Poirier, Solid State Properties of Fullerenes and Fullerene-Based Materials. C.M. Lieber and C.-C. Chen, Preparation of Fullerenes and Fullerene-Based Materials. J.D. Axe, S.C. Moss, and D.A.Neumann, Structure and Dynamics of Crystalline C60. W.E. Pickett, Electrons and Phonons in C60-Based Materials. C.M. Lieber and Z. Zhang, Physical Properties of Metal-Doped Fullerene Superconductors. Author Index. Subject Index. Fullerenes or "buckyballs,"a new carbon-based family of materials, have fascinated the scientific community for the past few years. These materials are likely to find applications ranging from lubricants to batteries to biological magic bullets, which will be of great importance in the science and technology of the next century. This carefully edited volume, the first to include Frans Spaepen as co-editor, summarizes our present understanding in a series of didacticarticles, which take the reader from the fundamentals to the present cutting-edge research. 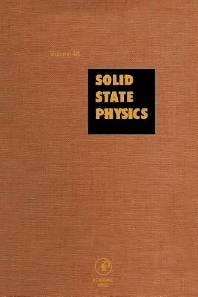 A general overview is followed by chapters devoted to synthesis and characterization of fullerenes and their derivatives, the novel structural properties of buckyballs, tubes, and buckyonions, a theoretical and experimental view of electrons and phonons, and finally to the fascinating superconducting properties of these materials. Materials scientists, solid state physicists, and chemists.